10 year old Canadian Whisky. More complex than most. Notes: This whisky is primaily a rye based whisky but does not fit the American definition of rye for the sake of labeling. It is aged for 10 years in charred oak barrels then mixed with glacier water from Mt. Hood (Oregon’s highest mountain). Hence, while it’s bottled in the lower 48, it’s Canadian. A portion of the sales proceeds goes toward the Pendleton Roundup Rodeo, one of the oldest around. 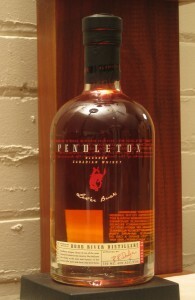 This is the younger, cheaper brother of Pendleton 20 Year Old Directors Reserve (about $75.00 750ml). Appearance: Dark copper in the bottle, bronze gold in the glass. First Impression: Heavy malt, leather, pecan, caramel, tobacco,oak grain influence with caramel sweetness and char developing. All good whiskey smells. Taste: Slightly light body,slightly astringent, light sweetness backstopped by malt and oak pepper. Spicy, aromatic, grainy/malty medium-to-long smoky and sweet finish. Quite smooth and mellow. Drinks: Makes for a more complex cocktail than the average Canadian whisky. Cigars: Light-to-medium. A Rocky Patel or a Joya de Nicaragua. Final Thoughts: Much more complex and interesting than most of the Canadian whisky out there. It is a good bargain for someone seeking a better brand and is much older and more drinkable than most Canadian whisky. If you tend more toward single malt scotch than regular Canadian whisky you will like this one. Bottle: Basic clear glass, slightly bell or apothecary shaped bottle with a short neck. Heavy decanter style bottom. Name of whiskey (and type) is silk screened onto the glass along with a small silhouette of a cowboy riding a bronco (c.f. Pendleton Roundup Rodeo). Small paper label at bottom in old-style script. Wooden top (with same silhouette)and real cork closure give it a vintage feel. Nicely done proportions and layout along with attractive bottle makes it look nice on the shelf. Not a lot of details, history or background but does tell you how/where to get it.